Your loan is on the way. Call us if you don't see it in your PayPal account in 24 hours. 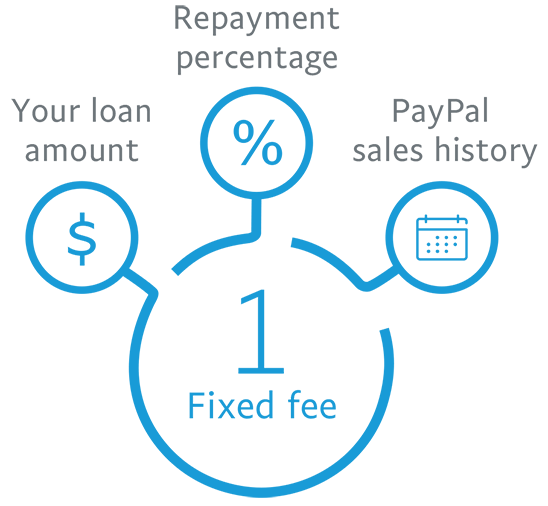 Why choose PayPal Working Capital? You choose a share of your sales to automatically deduct as payments, so managing your cash flow is easier. Don’t worry about periodic interest or hidden fees—you pay just one affordable fixed fee you know when you apply. Your loan is based on your PayPal sales, so no credit check is required, and it doesn’t affect your credit score. There’s no time-consuming application or check of your financial history. Approved loans are funded in minutes. Get to know the basics. *The maximum loan amount can be up to 35% of your annual PayPal sales, and no more than $125,000 for your first loan. PayPal Working Capital is based on your PayPal sales history, so you receive an amount that fits your business. There’s no credit check when you apply, so there’s no effect on your credit score. And if you’re approved, you’ll get your funds in minutes. The amount of your loan. The repayment percentage you select. Your business's PayPal sales history. There are no other fees and no periodic interest. You pay back the loan automatically with a percentage of your sales that you choose when you apply. The higher your sales, the faster you repay. On days without sales, you won’t pay a thing, but you need to repay a minimum of 5% or 10% every 90 days to keep your loan in good standing. You can also make manual payments and even pay the loan in full anytime with no early repayment fee. *In limited cases, the loan decision may take up to 7 days. ^Source: PayPal competitive analysis based on common industry practices. Times are average only and may vary. Fees are indicative of the types that may be charged by other providers. Results may not be typical and may vary substantially across businesses. PayPal Working Capital is a business loan with one affordable, fixed fee. You repay the loan and fee with a percentage of your PayPal sales. There are no periodic interest charges, monthly bills, late fees, pre-payment fees, penalty fees, or any other fees. Select your loan amount. The maximum loan amount depends on your PayPal sales history. 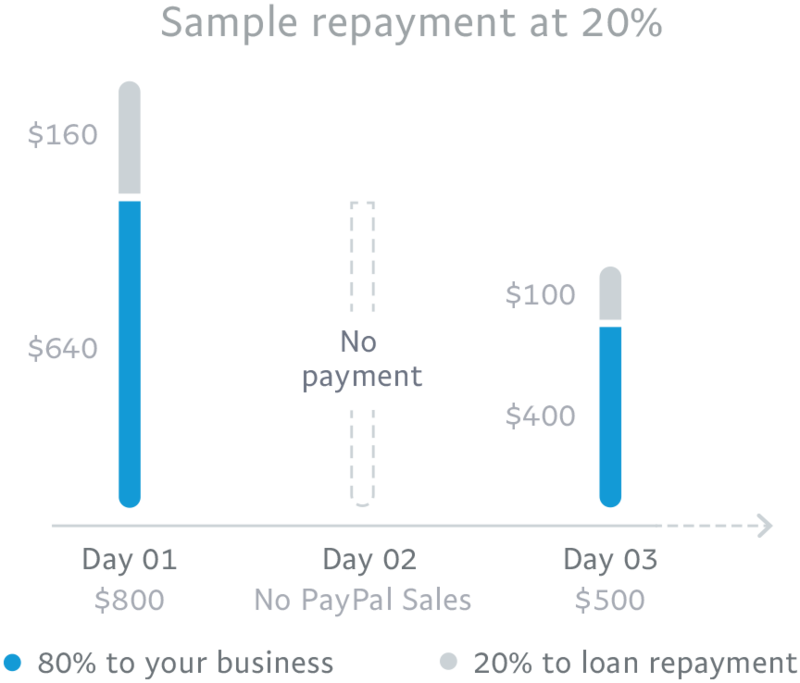 Choose the percentage of your PayPal sales that will go toward repaying your loan and fee. If approved, receive the funds in your PayPal account within minutes. Repay automatically with a percentage of each sale until your balance is paid in full. You can also make manual payments or even pay the loan in full with no early repayment fee. Am I eligible to apply for PayPal Working Capital? What materials do I need to apply for PayPal Working Capital? For many merchants, all you need is some basic info about your business and yourself, as the authorized representative on the account. However, for certain business types, you will want to have additional information on hand. You will need the contact details, birth dates, and Social Security numbers of your primary business owners and business management, as well. These people won’t have access to the account (unless you authorize them on your PayPal account), and the information won’t be used for a credit check. What fees do I have to pay with PayPal Working Capital? Unlike traditional loans, PayPal Working Capital charges a single, fixed fee that you’ll know before you sign up. No periodic interest, no hidden fees, and no late fees. What is the minimum repayment requirement? Because your automatic repayments get deducted as a percentage of each PayPal sale, the amount you repay each day changes with your sales volume. The more you sell, the more repayment progress you’ll make that day. On days without sales, you’ll make no payments, but there is a minimum repayment requirement every 90 days. Depending on the loan terms you choose, you must pay at least 5% or 10% of your total loan amount (loan + the fixed fee) every 90 days. The 5% minimum applies to loans estimated to take 12 months or more to be repaid, based on your business’ past PayPal sales and other factors. The 10% minimum applies to loans estimated to be repaid within 12 months. If you borrow $10,000 ($9,800 loan + $200 fixed fee) and the loan is estimated to be repaid in 13 months based on your previous years’ PayPal sales, then your minimum repayment is 5% or $500, every 90 days. If you borrow $30,000 ($29,500 loan + $500 fixed fee) and the loan is estimated to be repaid in 8 months based on your previous years’ PayPal sales, then your minimum repayment is 10% or $3,000, every 90 days. For most of our customers, regular automatic repayments easily cover the minimum and this is never an issue. But if you do get behind, you can make additional payments on the PayPal Working Capital website. If you do not meet the minimum and your loan goes into default, your entire balance could become due and limits could be placed on your PayPal account. Please see Section 12 of the Terms and Conditions to learn more about default. Can I get more than one PayPal Working Capital loan at a time? PayPal Working Capital loans are issued one at a time. You can apply after paying off one loan to get another one – many merchants do. Keep in mind that it can take up to 3 business days for your final payment to process before you’ll be able to apply for a future loan, which will then be subject to approval. Call us and we'll be happy to help. The Lender for PayPal Working Capital is WebBank, member FDIC. With PayPal Working Capital, payments are flexible and change with your sales. But sales can sometimes vary, so there’s also a minimum repayment requirement. Depending on the loan terms you choose, you’ll need to pay at least 5% or 10% of your total loan amount (loan + the fixed fee) every 90 days. For most of our customers, regular automatic repayments easily cover the minimum and this is never an issue. For more details, please see our FAQs. See an example of how our fees work. Your actual offer, repayment percentage options, and fixed fee may vary depending on the information you provide when you apply. This is one of the factors we use to estimate your loan. It’s okay to guess. Premier account holders must process at least $20,000 and Business account holders must process at least $15,000 to be eligible to apply for PayPal Working Capital. Try different amounts to understand how the numbers change. Loan amount can be up to 35% of your annual PayPal sales, and no more than $125,000 for your first loan.